GIA certified cut- cornered rectangular modified brilliant cut diamond 3.01 carat (I color, VS2 clarity) ring set in platinum halo diamond setting. Size 7. This GIA certified ring is currently size 0 and some items can be sized up or down, please ask! It weighs 0 gramms and is Platinum. GIA certified rectangular brilliant modified 1.01 carats diamond (F color, I3 clarity) ring set in 14k white gold setting with over 0.50 carat in diamond accents. Size 7. This GIA certified ring is currently size 7 and some items can be sized up or down, please ask! It weighs 5.5 pennyweights and is 14k White Gold. GIA certified emerald cut diamond 3.95 carat (F color, VVS2 clarity) ring set in platinum setting with 2 tapered baguette diamonds 0.38 carats each (G color, VS clarity) on the sides. Size 7. This GIA certified ring is currently size 7 and some items can be sized up or down, please ask! It weighs 2.8 pennyweights and is Platinum. GIA certified marquise brilliant cut diamond 1.58 carat (F color, VS1 clarity) ring in 14k white gold setting. Size: 7. This GIA certified ring is currently size 7 and some items can be sized up or down, please ask! It weighs 1.9 pennyweights and is 14k White Gold. GIA certified round brilliant diamond 0.79 carat (H color, I2 clarity) ring set in 18k white gold and platinum setting with round and taperred baguette diamonds on each side. Width at head: 7.1mm. Size 7.5. This GIA certified ring is currently size 7.5 and some items can be sized up or down, please ask! It weighs 3.7 pennyweights and is 18k & Platinum. This GIA certified ring is currently size 5.25 and some items can be sized up or down, please ask! It weighs 4.6 pennyweights and is White Gold. GIA certified round brilliant cut diamond 6.53 carat (J color, VVS2 clarity) ring set in platinum setting. This GIA certified ring is currently size 0 and some items can be sized up or down, please ask! It weighs 0 gramms and is DIAMOND. GIA certified round brilliant cut diamonds studs 1.51 carat (I color, SI2 clarity) and 1.50 carat (H color, SI2 clarity) set in 14k white gold. GIA certified round brilliant cut diamond 1.10 carat (F color, VS1 clarity) with 14 x 0.25 carat each diamond eternity band all in platinum. Size 8.5. This GIA certified ring is currently size 8.5 and some items can be sized up or down, please ask! It weighs 4.6 pennyweights and is Platinum. This GIA certified ring is currently size 6.75 and some items can be sized up or down, please ask! It weighs 4.6 pennyweights and is Platinum. GIA certified round brilliant cut diamond 1.12 carat (M color, VS1 clarity) ring set in 14k white gold setting with six prongs and semi-set diamond accents. Size 7. This GIA certified ring is currently size 7.25 and some items can be sized up or down, please ask! It weighs 2.1 pennyweights and is 14k. This GIA certified ring is currently size 7 and some items can be sized up or down, please ask! It weighs 3.5 pennyweights and is Platinum. GIA certified round brilliant cut diamonds studs 1.03 carat (M color, SI2 clarity) and 1.02 carat (M color, SI2 clarity, Excellent symmetry) set in 18k white gold. Total 2.05 carats. This GIA certified ring is currently size 7.5 and some items can be sized up or down, please ask! It weighs 7.2 pennyweights and is Platinum. GIA certified circular round brilliant cut diamond 0.96 carat (I color, VS1 clarity) solitare ring in platinum setting. This GIA certified ring is currently size 5.5 and some items can be sized up or down, please ask! It weighs 2.8 pennyweights and is Platinum. This GIA certified ring is currently size 6 and some items can be sized up or down, please ask! It weighs 5.2 pennyweights and is Platinum. GIA certified round brilliant cut diamond 1.01 carat (H color, VS1 clarity) ring with 2 sapphires set in platinum. GIA certified round brilliant cut diamond 1.01 carat (H color, VS1 clarity) ring with 2 round sapphire side gems set in platinum. Size 5. This GIA certified ring is currently size 5 and some items can be sized up or down, please ask! It weighs 5.6 pennyweights and is Platinum. GIA certified square modified brilliant cut diamond ring 2.03 carats (E color, SI1 clarity) in 18k white gold setting approx.1 carat in baguette diamonds. Size 5. This GIA certified ring is currently size 5 and some items can be sized up or down, please ask! It weighs 4.4 pennyweights and is 18k White Gold. This GIA certified ring is currently size 6.25 and some items can be sized up or down, please ask! It weighs 4.1 pennyweights and is 18k White Gold. GIA certified old european cut diamond 1.58 carat (M color, SI1 clarity) ring set in platinum setting with two baguette diamonds on the side. Size 9. This GIA certified ring is currently size 9 and some items can be sized up or down, please ask! It weighs 4.2 pennyweights and is Platinum. GIA certificate modified triangular brilliant cut diamond studs 1.51 carat (I color, I1 clarity) and 1.59 carat (G color, SI2 clarity) set in 3 prong 14k yellow gold filigree design setting. Total 3.10 carats. GIA certified rectangular modified brilliant diamond 0.71 carat (G color, VS2 clarity) with Halo setting in 18k white gold with 0.63 carats in diamond accents in setting. Width at head: 9.0mm (0.35") x 9.0mm (0.35"). Width at shank: 1.8mm (0.07"). Size 6. This Diamond ring is currently size 6 and some items can be sized up or down, please ask! It weighs 2.6 pennyweights and is 18k. GIA certified round brilliant cut diamond 1.22 carat (G color, SI1 clarity) ring in platinum 4 prong setting, 129 facets for double the brilliance! Also comes with Gemex Light Performance report. Size 6.25. This GIA certified ring is currently size 6.25 and some items can be sized up or down, please ask! It weighs 2.5 pennyweights and is Platinum. GIA certified cushion brilliant cut diamond 0.87 carat (H color, I1 clarity) ring set in beautiful 14k yellow gold with three diamonds on each side. Size 6. This GIA certified ring is currently size 6 and some items can be sized up or down, please ask! It weighs 3.4 gramms and is 14k. GIA certified rectangular modified brilliant cut diamond 1.01 carat (F color, SI1 clarity) ring set in 14k white gold with approx. 0.60 carat of side princess cut diamonds. Size 6.5. This GIA certified ring is currently size 6.5 and some items can be sized up or down, please ask! It weighs 2.2 pennyweights and is 14k White Gold. GIA certified round brilliant cut diamond 0.97 carat ( F color, SI1 clarity) ring set in 18k white gold. Size 7. This GIA certified ring is currently size 7 and some items can be sized up or down, please ask! It weighs 0 gramms and is 18k White Gold. GIA certified round brilliant cut diamond 0.90 carat (E color, VVS2 clarity) set in platinum setting. Size 6. This GIA certified ring is currently size 6 and some items can be sized up or down, please ask! It weighs 2.9 pennyweights and is Platinum. This GIA certified ring is currently size 5.5 and some items can be sized up or down, please ask! It weighs 0 gramms and is Platinum. GIA certified round brilliant diamond 1.22 carat (H color, VS1 clarity) ring set in platinum with 0.30 carats in diamond accents. Width: 6.6mm. Size 7. This GIA certified ring is currently size 7 and some items can be sized up or down, please ask! It weighs 0 gramms and is Platinum. Established in 1931, GIA is the world’s foremost grading and certification authority on diamonds, colored stones, and pearls. A public benefit, nonprofit institute, GIA is the leading source of knowledge, standards, and education in gems and jewelry. In 1953, the GIA developed its International Diamond Grading System and the Four Cs (cut, clarity, color, and carat weight) as a standard to compare and evaluate the quality of diamonds. The key to GIA– they don't buy, sell, trade or cut diamonds – they don't value (how much is my diamond worth?) so there is no conflict of interest, ulterior motives for higher or lower grading. Multiple diamond gemologists score each diamond and must agree. This avoids "pay offs", dishonest deals for exaggerated color or clarity grading. Their integrity over the years has earned them the ‘Gold Standard’ reputation worldwide. The GIA Laboratory provides a variety of gem grading and identification reports. Diamond grading reports for unmounted natural diamonds determine their key characteristics: color, clarity, cut and carat weight. 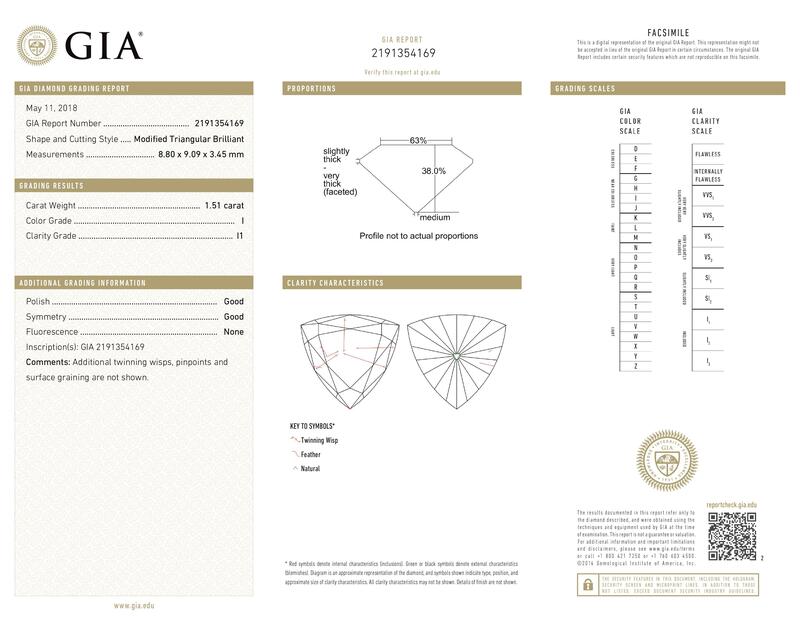 GIA issues a complete Diamond Grading Report. The reports contain a number of measurements, unique to the individual diamond being evaluated, including length (millimeters), width (millimeters), and depth (millimeters), as well as a diagram of where and what types of inclusions (flaws) are located in or on the diamond. Diamond grading reports are now demanded by most consumers purchasing diamonds over a certain size, typically for over 0.5 carat (100 milligrams), and almost always for over 1.0 carat (200 milligrams), and are considered an important tool in guaranteeing that a diamond is accurately represented to a potential buyer. Gray & Sons goes an extra step and pays GIA to engrave the certificate number on the diamond after grading – to offer our customers peace of mind to know – the “Pedigree” delivered with their diamond is really for THAT diamond. At Gray & Sons, we offer a wide selection of GIA-certified diamond rings, bracelets, necklaces, pendants, and loose diamonds. Large diamond jewelry from our inventory comes with a GIA certificate. We have two in-house GIA-Certified Diamond Gemologists and Colored Stones Specialists.